What to Eat to Heal the Gut? What To Eat and Not-to-Eat To Heal the Gut? When our guts are out of balance, we end up with inflammation throughout our bodies and many underlying health issues that throws the whole equation above OUT OF BALANCE! But if we put our focus on healing our guts, we can reduce the inflammatory and immune processes involved in so many different diseases and put ourselves onto a path to health! By focusing on eating the right foods, we can see HUGE health improvements. Most vegetables—Asparagus, spinach, lettuce, broccoli, beets, cauliflower, carrots, celery, artichokes, garlic, onions, zucchini, squash, rhubarb, cucumbers, turnips, watercress, and others. Fermented foods—Sauerkraut, kimchi, fermented cucumbers, coconut yogurt, kombucha, and water kefir that have been homemade. If you have symptoms such as chronic bad breath, sinus congestion, are depressed or anxious, have fatigue and/or low energy, bloating and gas, brain fog, any autoimmune disease, reflux, heartburn, or even chronic stress, then you can benefit from a healing diet! Focus on eating the right foods and getting rid of the wrong and you really can discover a whole new world of health! 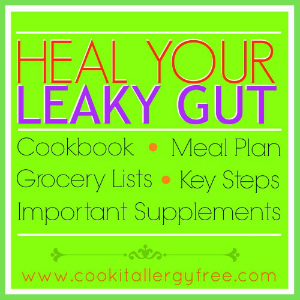 If you are looking for some good meal plan ideas and recipes to heal your gut, here are some of my absolute favorite gut-healing recipes, supplements, and meal ideas focused on HEALING THAT GUT!! When we heal our guts, we can discover a whole new life. I would love to help you. I will send you a separate email to see what I can do to help you. I can’t have eggs, bananas, chicken, beef, coconut, ginger, coffee…they all came up as really high IgE sensitivities. I am running out of breakfast ideas.